Did you know that 50,000 people die of venomous snakebites in India every year? Deaths that could be averted if people had access to an effective anti-venom cure. This was one of many startling discoveries at the end of the screening of A Million Snakebites by the Gerry Martin project at the British Council. The Gerry Martin Project is an initiative for wildlife conservation and education, spearheaded by Bangalore based Gerry Martin. In this film made for the BBC, reptile conservationist Rom Whitaker travels across India, from Tamil Nadu to Rajasthan to Assam, collecting snake venom in an effort to arrive at an anti-venom cure for all snake bites. Anti-venom used in India is currently made only from the venom of South Indian snakes. Rom believes that the venom from North Indian snakes could be different, and adding this to the pool might solve the problem. While journeying on his quest, Rom unravels many of the myths that surround both snakes and snake bites. He repeatedly re-iterates that the only real cure for snakebites is anti-venom treatment, administered in a hospital. In this way, travelling on camel back and foot across wild and urban terrain, Rom also helps the audience work through their fears associated with snake bites. Taking the venom from a Saw-scaled viper is a very risky job as only a few drops are needed to seriously harm a human. One of Rom’s big questions is to find out whether these snakes have regionally varying venoms, a vital clue in saving more lives across India. [source: BBC] Milking a snake for the production of antivenom. Pic courtesy: Wikimedia Commons/Barry Rogge. conservation in the 70’s, founded the Madras Crocodile Bank Trust/ Centre for Herpetology, led the Gharial Conservation Alliance and started the Agumbe Rainforest Research Station. This station is also conducting the first radio telemetry study on king cobras in the world. So A Million Snakebites is another small step in this larger journey. But besides this, the film is an important moment for wildlife documentation and is another significant note in the study of the social anthropology of the subcontinent. The film’s greatest achievement is that it translates these themes into everyday idiom that easily absorbs the viewer. At the end of the session, Rom even fielded questions from an enthusiastic audience, some of whom who had not yet turned 15. Had he ever been bitten by a snake? What was a dry bite? Were snakes an endangered species? Rom answered them all. While quick to admit that snakebites were a bigger problem in rural India, as compared to urban or semi-urban India, Rom said that screenings like this were important to spread awareness. Those who lived in more rural surroundings could even take the message back with them. Another significant moment of this interaction came when a member of the audience asked him, “What had the snakes been telling him over his last four decades as a conservationist?” Rom replied, “Animals are all innocent. This is true of snakes too.” It is humans who have disrupted their habitat, often displaying extreme intolerance. In this spirit, this film was also another important contribution to Rom’s lifetime’s work of reptile conservation. Meanwhile, Rom’s quest for an effective anti-venom cure has not ended. Supported by The Gerry Martin project, he will now continue his search in Arunachal Pradesh and Kerala this year. So the journey continues. Christina Daniels is a communications professional based in Bangalore. She is the author of the cinematic filmography "I'll Do It My Way: The Incredible Journey of Aamir Khan". Before this, she authored the novel "Ginger Soda Lemon Pop" and co-authored "Mind Blogs 1.0". For years, institutes such as Max Muller Bhavan, Alliance Francaise and the British Council have been a part of Bangalore’s cultural scene. Get a taste of the global and the local through their interesting initiatives. An entire day by the lakeside. Workshops, walks, awareness sessions, rangoli, painting, orchestra and fun. Over 3000 citizens celebrated Kere Habba on the Kaikondrahalli lake premises. How do insects fly? Can we mitigate snakebites? 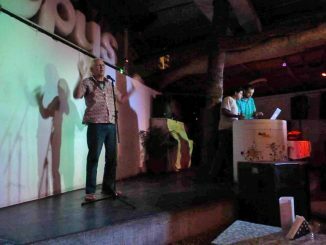 A new event series connects Bangaloreans with subject experts in a lively setting.